If you could wish for any ONE thing for yourself (yes, be selfish) in life, what would that be? I am not talking about world peace and health for everyone. I am talking about something that would make YOUR life easier, more fulfilling, happier etc. One things that many people (including me) struggle with a lot is finding TIME for regular exercise. Everybody knows about the importance of exercise for our health (after all, it’s the top New Year resolution year after year) but few of us put Exercise (Pilates or not) at the top of our priority lists. I agree, finding a full hour to exercise 3-5 times a week is impossible for most people. But what will happen if we replace the QUANTITY of time spent exercising with the QUALITY of time exercising? You will be able to accomplish one of your health goals AND still have time for other things in your life. That’s the exact idea behind a Pilates workout that I want to share with you today. Last week I asked Pilates teachers: If you could do only ONE Pilates mat exercise every day for a full year, what exercise would you choose? From all of the answers 9 exercises stood out the most and these are the ones that I included in this workout. I have prepared 2 versions of this workout for you. Version 1 is 20 minutes long, has detailed instructions and some modifications, has slower pace so that you can learn the exercises as well as the transitions. Version 2 is 9 minutes long and guides you through the workout that you have already learned in Version 1 with minimal instruction, short cues and focus on flow. The Hundred – “This one exercise does such a great job at warming up and waking up the whole body up for anything to follow.” Laurie N.
“So many variations to chose from playing with leg position, breath, rhythm, props, etc.” Kristen M.
Rollover – “The spinal articulation and the core control, a go to for me after a day in the office.” Claire H.
Double Leg Stretch – “Because every exercise comes out of double leg stretch!” Monica H.
Teaser – “It always puts me in my place! Just when I think I am strong and masterful I can always improve my technique and lift. 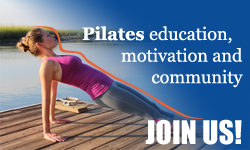 Makes my pilates practice a lifelong learning that i can always improve upon.” Rachel H.
Boomerang – “It’s so many exercises in one” Angelica P.
The Seal – “The spinal massage always feels good and the “playfulness” of the exercise always reminds me to enjoy life!” Laure L.H. STEP 2. Comment below using your Facebook account by answering the question: If you could wish for any ONE thing for yourself (yes, be selfish) in life, what would that be? Check “Also post on Facebook” to share your comment and the giveaway. Answer the question: If you could wish for any ONE thing for yourself (yes, be selfish) in life, what would that be? I am wishing you more time in the new year 🙂 Glad you enjoyed the workout! The Pilates workouts I have kept from my 2013 emails until now, have given me a sense of what I really wish for now. As I get older, I wish that I continue to find strength, to continue to work on my core and watch what I put in my body. I am so happy to be following your Pilates routines in 2017.